Whether you just started going steady or if you’ve been in a serious relationship for a while now, a gift for your boyfriend is an excellent opportunity to remind him of what he means to you. If you don’t know where to start, think about things he already does on a regular basis and build from there. No matter what, just remember that the most important to him is the time you share together. And once you’re done with this list, don’t forget to check out our gift finder for extra help. He is the first person on your speed dial and the last person you talk to before you go to sleep. Your smartphones keep you feeling connected, so why not get him a gift that protects his device. The Love Bokeh iPhone Case is the perfect design to display four photos that encapsulate the special bond you both share. Whether he’s a musician who enjoys song writing or an entrepreneur who always has new business ideas, your boyfriend is constantly in need of a reliable place to keep track of his creative thoughts. The classic leather lined journal is durable enough for everyday use, so that he can always write wherever he goes. Also when he sees the cute photos of you two on the cover, it will increase the chances that you’ll be receiving sweet love notes shortly thereafter. For a practical gift for the boyfriend that has a serious case of wanderlust, ponder the idea of getting him a luggage tag as a gift. The When In Doubt Travel Luggage Tag is a great style that will capture his passion while also featuring your two favorite photos on the front and back. No matter how much he daydreams, this is a gift that will ensure his valuables don’t get lost in the process. How about a gift idea that displays some of your favorite memories and also prevents those water rings from appearing on his coffee table? 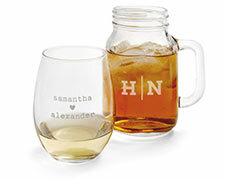 With a set of personalized coasters, your boyfriend will definitely enjoy seeing photos from the highlights of your relationship every time he goes to take a sip from his drink. If one of his favorite things to do after a long week at work is to enjoy the smooth taste of an ice, cold beer from his favorite brewery, then a pilsner glass is an excellent gift idea that will have your boyfriend saying “Cheers!”. 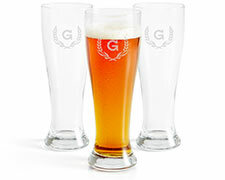 Fill up his heart with the Keyline Monogram Pilsner Glass by adding a special touch with his name and initial sandblasted on the side of it. Surprise your boyfriend with a thoughtful collage of photos for all to see. Whether it was that time he caught the trophy fish on your trip to the lake, or when you watched the sunrise while camping on the mountain together, the Rustic Collage Canvas Print is an excellent medium to display all of your most special moments. As an added bonus, the wrapped edges will allow him to hang it without a frame. Some of the best memories you have with your boyfriend are from when you both decided to stay in on a Friday night and binge watch your favorite television series. Add a little style to your boyfriend’s apartment while keeping his head comfortable with a personalized Collage Squares Pillow. Make sure to include some of his favorite photos on it so that he still feels loved, even when you’re not around. You and your boyfriend have shared countless memories throughout your relationship, ranging from the first night you met at the costume party to the road trip you took him on so he could finally meet your parents. Let him celebrate every moment in between by getting him a photo book as a gift. With the Simply Black style you’re given a bold, modern layout to feature all of the most memorable experiences that you’ve had together.